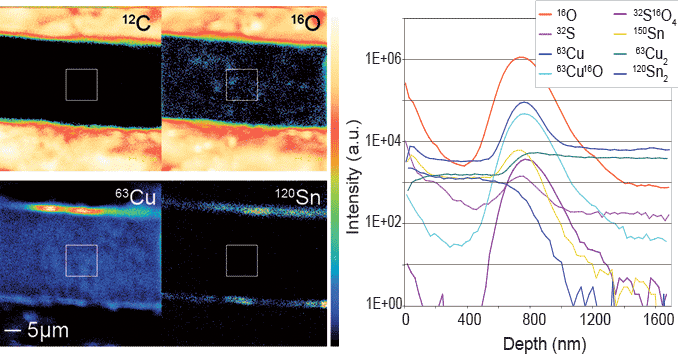 Small area analysis in Sn/ Cu wire structures with CAMECA IMS 7f-Auto ion microprobe. Direct Ion Imaging (“Microscope”) mode to acquire images up to a thousand times faster than with any scanning ion microprobe (all pixels are acquired in parallel). Optimized for «large» area mapping. Scanning Ion Image (“Microprobe”) mode for sub-µm lateral resolution with O2+ and Cs+ beam. Dedicated to small area analysis. Small area analysis: both in-depth and lateral information. Small area analysis in Sn/Cu wire structure: the images on the left side were acquired for different species using the microprobe mode. Using the CAMECA WinImage software, it is possible to obtain a retrospective depth profile: in the above example, a depth profile (right side) was obtained from the ion images (central area, left side) which were recorded sequentially while sputtering in-depth. Note the high dynamic range in imaging mode.